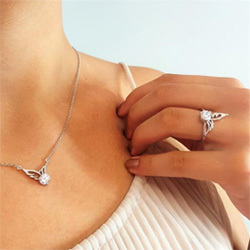 This delicate angel wing bracelet, accompanied with a circular pendant and adorned with a beautiful angel wing provides a subtle way to commemorate the loved ones we have lost, yet they will hold a special place in our heart forever. SAVE ADDITIONAL 20% ON ORDERS OVER $75, ENTER CODE ANGEL AT CHECKOUT! I bought this for niece who lost her best friend and she fell in love with it. This is mine and I love it, not that needed to be reminded of my son. Lovely pieces. I wear this in memory of my son. I love reading the message on it. I love this bracelet !!! It’s more than I expected and prettier than the picture!!! So happy with it!! Love it! Nice quality! Great company! I bought 7 !!!!!! Love it ! Nice quality ! Heavy wire! Great service! Love it! Even prettier in person! And very satisfied on delivery time and contact with the owner! It is a gift but I am sure the recipient will love it. The design and message is what really touches the heart!! Love the pieces! I am very impressed with the style and quality . Have purchased from Lindastars before, has very nice sentimental products. I love it and so does the people I have them to, thank you so much. I absolutely love my product! the ordering was easy and I received it in the mail so fast!